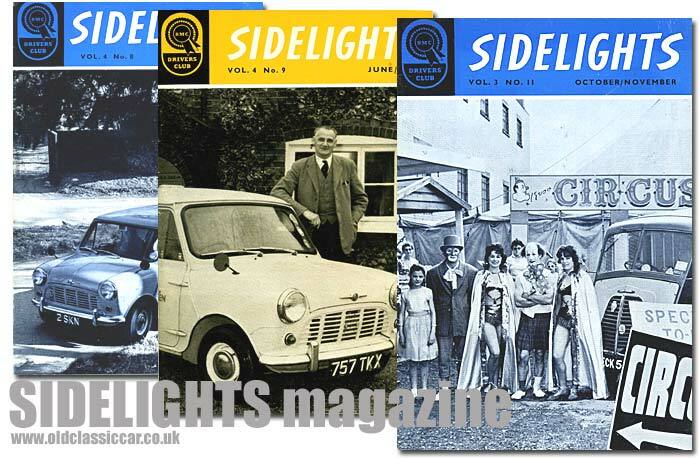 Sidelights, the BMC Drivers' Club official magazine. Homepage. This page: A magazine produced for owners of BMC (Austin & Morris) commercial vehicles, large and small. Sidelights (BMC Drivers' Club magazine). This page in the classic motoring magazines section takes a look at Sidelights, a magazine produced for members of the BMC Drivers' Club. This was a factory-run organisation, to which anyone with an interest in Austin and Morris commercial vehicles could join. The issues shown below all date to the early 1960s. 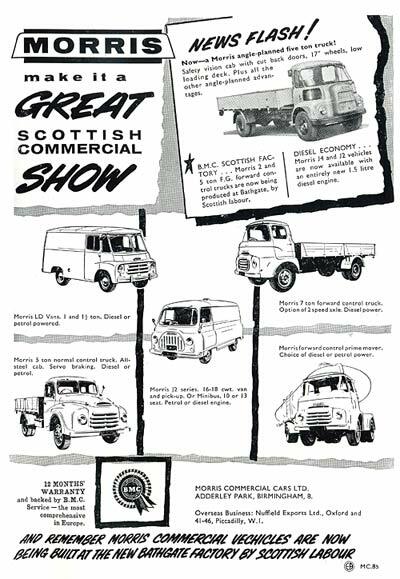 Magazines would feature a BMC lorry, van, pickup or taxi on the cover, this selection of covers all feature examples of lightweight commercials, from either the current range or recent past. The first magazine's cover has a Morris Minivan in the livery of the WVS Civil Defence - Meals on Wheels - service. Alongside that the next issue in the series, again with a Morris Minivan on the cover. The third copy shows a scene from a circus, with a Morris J Type van sneaking into shot, complete with a BMC Drivers' Club badge on its grille. It's the third issue, with the J Type van on the cover, that will now be looked at in more detail. Published for October - November 1961, it was issue No.11 of Volume 3. An advert on the inside cover shows a BMC lorry hard at work, under the headline "Big Men Buy Austin". The lorry was in use with Higgs and Hill, an engineering firm with depots in Leeds, London and Coventry. They operated no less than 47 7-ton Austin trucks and tippers. Each magazine opens with the thoughts of the club's "National Organiser", where he comments on various aspects of motoring. One item, regarding parking and parking charges, was no doubt of interest to the reader. In the same way that newspaper sellers would leave the day's newspaper on a stand, with an honesty box alongside into which the buyer would leave their payment, so a council in the Lake District was planning a similar arrangement for car parking. The council opened a "Trust the Motorist" car park in Ambleside - motorists would park up, and it would be up to them, and their conscience, to leave a 6d payment for a day's parking. Apparently Oxford council, an organisation not now known for welcoming cars to its city centre, was also planning a similar scheme. I wonder how honest the drivers of Ambleside and Oxford were? I suspect the idea didn't catch on in many other areas! Today's planners wouldn't miss an opportunity like that to wheedle out a little more income from the motorist. There then follows an article about a user of BMC vehicles, in this case the Ross Bro's Crown Circus, a touring circus owned and operated by brothers Tom & Tony Ross. Kenneth Cox, writer for Sidelights magazine, caught up with the troupe in Morecambe late one evening as the show was drawing to a close. Despite things winding down, there were still plenty of jobs to do - one of the clowns was catching up on a little carpentry, while another was doing some work to "an old Austin car which is used in one of the acts". As soon as I read this, I had an image of an Austin 7 with the doors falling off for the crowd, and over the page was a photo of - yes - an Austin 7, with three clowns perched upon it. Most of the circus company's support vehicles were Austins, with the Morris J Type van being used on local errands. Adorned with brightly-coloured posters promoting the circus dates, someone out there must remember seeing it, perhaps as a child? The registration was ECK 5? ?, a Preston registration used from 1951 on. Various snippets about club members are sprinkled throughout Sidelight magazine's pages. Desha Taylor, who with her husband ran a private coach hire business, had recently become the proud owner of an Austin 152 with the Kenex minibus conversion. This forward-control machine, almost identical to the Morris J2, was used for private parties and also on various school runs. Two pages are given over to a story about Mr William Miller, of Elgin, a member of the BMC Drivers' Club since 1956. His job title was Flock Master, and he was the proud owner of not only a very smart Austin A35 van, but also a Mk2 A55 Cambridge - ".. reserved for private use and taking out his wife and daughters on high days and holidays". He managed some 650 sheep, aided by his two Collies - Lassie and Smokey, both dogs regularly being driven around the countryside in the back of his trusty van. The van was registered FSO 537, making it a 1959-on example. The centre pages feature various club members, photographed with their trusty machines. Companies seen operating Austin and Morris vehicles include S. Allmark of Liverpool, Witherington & Over Bros. Ltd, Smiths (Potato Crisps), and a pale-coloured Austin 152 van owned and operated by Power Marine of Crawley. Anyone contemplating the purchase of a new van or lorry, could well be influenced into buying a BMC vehicle by reading the letters pages. Mr Kilfedder, for example, tells of his satisfaction in owning an Austin pickup: "I have been driving a 1958 Austin 1/2 ton pick-up for the past three years, over rough farm roads and even through fields. Have covered over sixty-five thousand miles without anything being done to the engine and it's still going as well as ever". No wonder so few light commercials ever get saved for preservation, they tended to get a real hammering and were lucky to survive ten years or so before being pensioned off, or converted into a kennel in the owner's yard. Fashionable attire for the BMC man. No longer need a van or lorry driver be seen in his vehicle wearing unsightly old overalls. The BMC Drivers' Club member may well have been attracted to the latest club clothing advertised on page 27. Perhaps a new tie for Sir? Hard wearing, produced in blue terylene, it would be a "wonderful" purchase, especially as it sported gold and red striping, with the BMC DC badge picked out in silver. If a members' tie was a little too subtle, then perhaps a smart sew-on blazer badge would be of interest? Embroidered onto a dark blue background, it could have been yours for just 6s 6d, post free from the Novelty Ties Company in Macclesfield. The inside rear cover of Sidelights magazine contains an advertisement for Morris commercial vehicles, vans and lorries that "... are now being built at the new Bathgate factory by Scottish labour". Models shown are the LD 1 and 1.5 ton vans, the J2 van, the normal-control 5 ton truck, a 7 ton truck, 2 and 5 ton Morris FG dropside lorries, and a large prime-mover. No mention of the Minor van. Return to the car magazines section, where many more old motoring titles are featured. These include Worldwide, a BMC title from the 1960s distributed to Austin/BMC dealers across the world. The editor of Sidelights magazine at the time was Peter Burdon - a photo of whom, sat in the back of a pre-war Austin 8 tourer, may be found on this page of the site.